I went to the dentist. Not a very likely reason to be cheerful but it was for me because I have a new dentist and I love him. This is a big deal because when I was 18 I had a dental trauma on a par with Willy Wonka, which I won’t go into (the blood simply spurted …) and as a result I absolutely dreeeeeeeeeeead the dentist. One side of my tongue has been numb ever since. The only one I ever liked was in Sydney and he used to have a telly over the chair I could watch Mr Bean on and the only problem was I used to laugh so much he couldn’t get his fingers in my mouth. It was the Christmas special with the turkey over the head which finished me off. By a marvellous bit of luck my new dentist specialises in nervous patients and just knowing that he acknowledges my fear and doesn’t despise me for it makes me feel brave. So that’s all great, because now I can get all the work I’ve been putting off for way too long fixed up at last. And if I do get freaked out, he’s going to clamp the gas and air on and I’ll be singing show tunes in no time. I have a pair of stripey socks which I like to wear around the house. They make my cat psychotically jealous and he attacks my feet viciously every time I wear them. It’s really painful. The full moon is also setting him off and to get across the landing I had to throw something to distract him and then run. 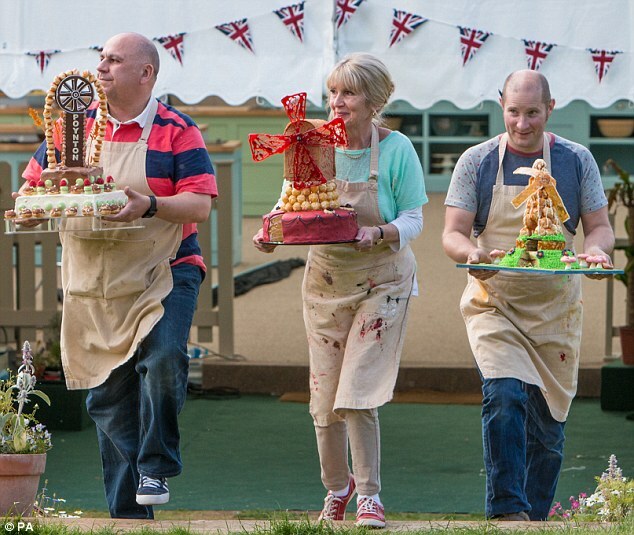 It was the final of Great British Bake Off with darling Mary Berry and silverback hottie Paul Hollywood and my favourite baker, Nancy, won. The red toffee sails on her Moulin Rouge windmill showstopper went round. ohhh, gas and air. How I’d love to try that and not be in labour. What a lovely dental situation all in all, lucky you. Oh that is SO SO lovely, thank you. I’ve got a 12 year old daughter too… I’ve had to take her iPhone away from her. Sound familiar? Yes very familiar. 2 of my daughter’s friends have had their phones taken away from them for extensive periods. I still threaten her with confiscation. She doesn’t have instagram or Facebook yet ( or perhaps should that read, not that we know of.). I’m just reading your September posts now as we had school hols here and I agree with the comments made about boundaries and activities for 12 year olds. Pegs has every bit of social media going (despite all my efforts to the contrary) and it has taken over her life. Not in a good way. I take the phone away a bit earlier each night… I have it by my desk to charge while she’s in bed and so many of her friends are still sending pointless messages at midnight. That’s hilarious – must be an occupational hazard of the profession!